This is interesting. 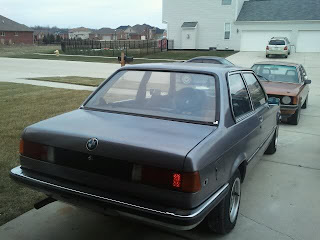 This is a 320, but not a common, 4 cylinder, 320i. It's a European, 6 cylinder, 320 (also known as a 320/6). Quite a few 323s came to North America via the grey market, but not many 320/6s. The seller does say when this was imported. 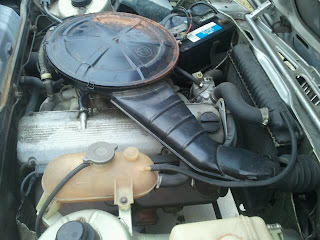 1979 was the first year of the 6 cylinder 320. 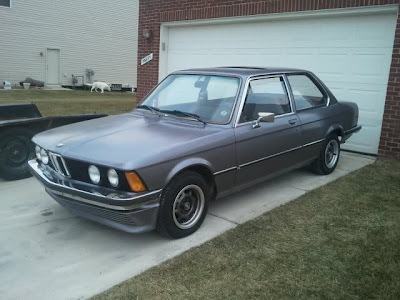 (Previously there was a 4 cylinder 320 in Europe.) The 320/6 has a 4 barrel Solex carb. In this form the engine actually has a few less horsepower than the North American fuel injected 4, but a lot more torque. This car is a project car, but it looks to be in pretty good shape. The seller is in the process of changing the interior from blue to black and repairing some surface rust. He says it "starts and runs good". Located in Macomb, MI, click here to see the Craigslist ad. I'd be mad if I just sold the car for $600 and now it's for sale for 5K? The seller must be joking right? I have a 80 320/6 4 bar carb any ideas on market value?